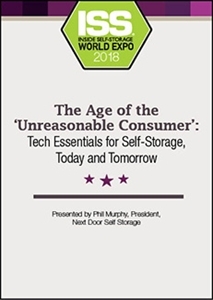 Today’s “unreasonable consumer” enjoys the power of choice and change, but how does this new age of consumerism impact self-storage? Our presenter will break it down, discussing customer-communication strategies, technological essentials for tenant convenience and facility automation. He’ll also offer insight to artificial intelligence, chatbots and social-media-based customer service that may change the industry moving forward.